I need help for my forum please and thank-you. 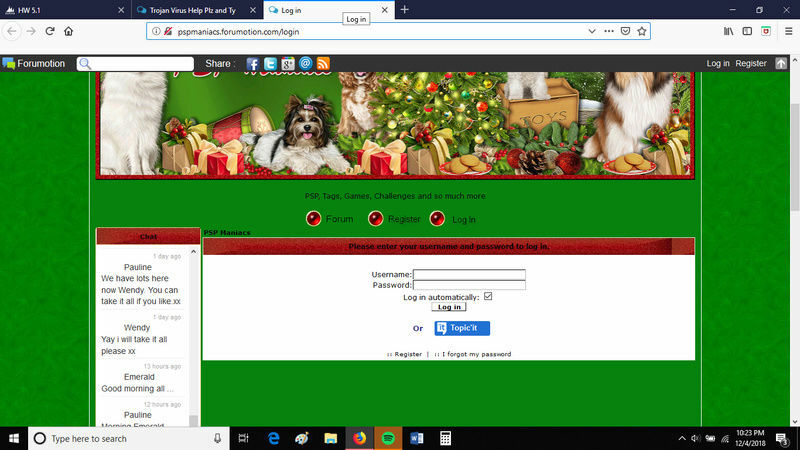 The problem is that a few members of mine can't log in cause they are getting a warning of a trojan popping up all the time. They are registered and have been a member for quite some time now but they can't log in cause of this. 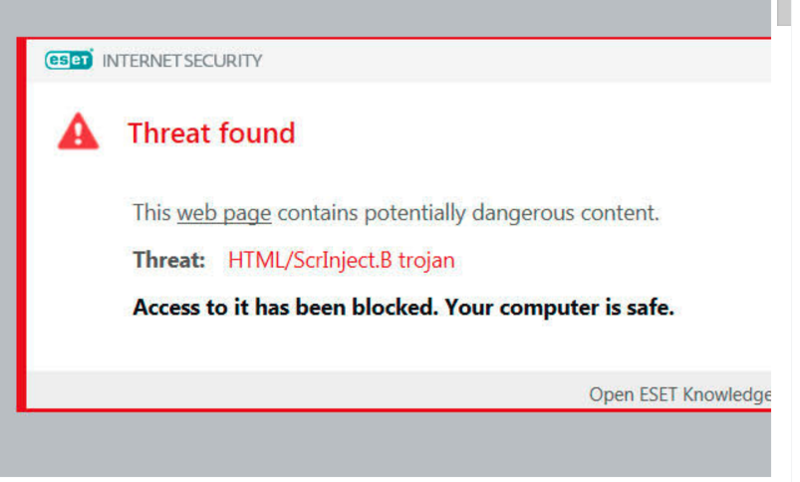 I will see if I can c/p what the trojan message looks like that they are getting and seeing. Sorry, but it won't let c/p it here. Anyway, please help. Thank-you. Thank you so much for your topic today. Can you help me with some more questions before we can help you more. Can you ask your members the following. Is this a browser popup that they are getting or is this their antivirus installed on their computers ? Is this only when they try to make a new account or is it when ever they try and log in. What browsers are they using ? have they gave some other computer a go to make sure it's not just that computer that is doing it. I asked the members the questions you wanted me too. Here is what she said. 2. I only get the message when I try to log into Maniacs and it won't allow me to go any further. It blocks the site completely. There is a trojan somewhere on the group or it would just clean what it was and allow me to get in. 3. It happens no matter which browser I use - whether it be IE, Firefox or Google Chrome. I've tried the three of them. I've scanned my computer completely with ESET NOD and Malwarebytes which is running all the time. There is no viruses or malware on my computer. Hope this helps. Thank you. So this exactly is only happening to one member? Nope. It was happening to another member as well but she left the group and I have no way of contacting her. But they were getting the same message. 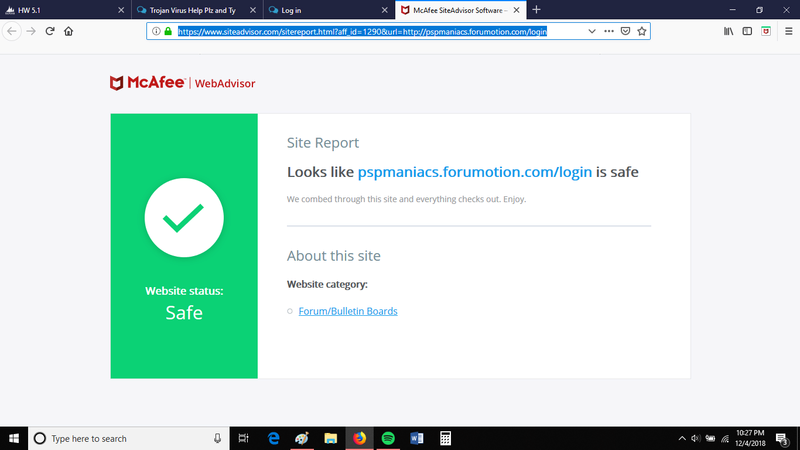 Is this your forum: http://pspmaniacs.forumotion.com/login ? Of course if whatever is causing it appears after logging in, that would be why it doesn't show for me. Could you provide us with a screenshot of the message you get? Since it doesn't seem to show for me. You could also try whitelisting the forum on your anti virus software to prevent it from being blocked when you try to enter. Remember to mark your topic when a solution is found. General Rules | Tips & Tricks | FAQ | Forgot Founder Password? Is this occurring on a mobile device? Oh ok, I didn't read the part where it said she asked the member those questions. In any case, it would still help to have a screenshot of the message the member was getting. Pretty simple. Tell her to install an adblocker and to uninstall Eset and Malwerbytes. Her laptop will be way faster and she will be browsing more safely. No it's not from a mobile device but a desktop computer. The member tried to get in using her hubby's laptop also but she still got the same message. I tried to c/p the message here but it won't work. I don't know how to do a screenshot of it. But if you will tell me how I will send it to you. And yes, that is my forum. But I and the rest of my members can get in with no problems. Here is a screen shot of what she is seeing when she tries to log in to my forum.Hope I got the right link here so you can all see it. General Rules | Tips & Tricks | FAQ | Lost Founder Password? If you want to reply to more than one post in this topic. you can use the multi-quote button in each post. This way you are not double posting. okay this sounds like an over active antivirus system reading the login warning of not having a HTTPS address. If after adding the address to the white list then we can make a report to our head office for them to pass on to our tech team. How do I add my forum to the white list and will it affect my forum or members from posting etc. Ty. It varies by the anti virus software. Google 'How to add a site to my whitelist' for the anti virus software you use. White listing your forum will only apply to you, since your just telling YOUR anti virus you consider that site safe and hence not to warn you. Other members having the problem will have to whitelist it for them too. Do you mean that other members having a problem has to whitelist my forum too? If so, will that fix the problem of them not being able to log in my forum and stop them from getting that Trojan message they keep seeing and getting. Are they exactly getting a virus or just a warning? She is getting the Trojan message every time she tries to log in to my forum. I have a screen shot above sent and you can see what she is seeing. Have you informed the affected members about this: Click Here? Not this one but something like it. She says her computer is not infected with it but that my forum is. But someone there did a scan of my forum and it said my forum is safe. She said that she did a scan on her computer and malwarebytes too but it came up clean. Each person getting the message has to white list the forum yes. It should solve it as then the anti virus shouldnt trigger any warnings for it since its on the whitelist. Every anti virus is different though, so it is hard to garuntee 100% that would be the case. Do you have ads on your forum? Nope, I don't think so. I haven't seen any. As brandon has said you will have to tell the members that get this warning to al add your site to the white list of their anti virus software. they can google how to do it and it will tell them step by step on how to add the address to the white list. the warning will then go away. I also see you have a chat box in your widgets maybe the warning is coming from that try and remove it for a little bit and ask them to try again. Some times them chat boxes are not always trusted by anti virus software. Ty everyone for all your help. My member can get in now. Plz close this topic now. Ty.